Have you ever wondered how mega-corporations manage their social media initiatives? Keep reading for a fascinating inside look at Intel Corporation’s sophisticated social media initiatives. 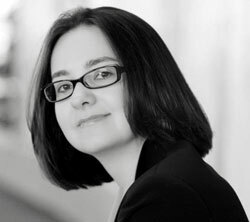 I interviewed Ekaterina Walter, a social media strategist at Intel to better understand how the company is using Facebook. For the last two years, Ekaterina has been part of Intel’s Social Media Center of Excellence. In addition to developing social media policy for their 80,000 employees, the center is also responsible for strategy, training and monitoring. Ekaterina manages Intel’s Facebook page. During this interview, you’ll gain insight into how large corporations manage their social media activities and discover some of the innovative ways that Intel is using Facebook. Mike: Let’s talk about Intel’s Facebook page. You have more than 115,000 fans on your page. Would you share whom you’re targeting and how Intel is using Facebook? Ekaterina: We created a Facebook page to provide a place for folks to talk about technology and, of course, Intel products. The people that were immediately interested in dialoguing with us were the tech-setters—the ones building their own systems. These were tech “geeks” in the best sense of the word. Most of our growth is organic. In the beginning, it was about 3% to 4% a month. Then we decided to get more serious about engaging, posting more interesting content, answering questions and just posting more often. We started seeing about a 10% to 12% monthly growth. This shows you how important the right type of engagement is for growing a fan base. 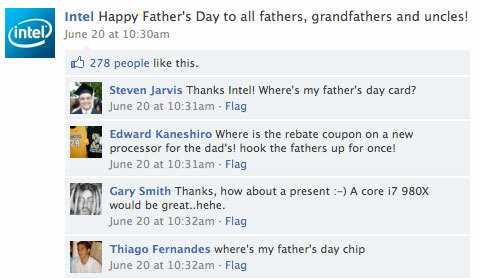 Intel's Facebook page contains fun videos and engaging discussion. Now we’re exploring ways to bring more of a mainstream audience to our page and add content that will keep them interested and be a little bit less techie. Mike: You were experiencing a 10% to 12% growth once you started implementing some of these tactics and strategies. You mean your numbers of fans were growing by that much? Mike: In the beginning, you were targeting tech-setters or “geeks.” Were you trying to target the people working inside of the IT centers in corporations, or were these the people at home just building their own computers? Whom do you think you were going after in the beginning? Ekaterina: Quite honestly, if you look back 20 or 30 years ago, we have been talking to folks in computer clubs. It has not only been folks who work for bigger companies who are now bigger customers that we sell the ingredients to, but also folks who do their own build – smaller mom-and-pop shops that build a system and then sell it. And then there’s the totally 100% geeks who sit in their basement and build their servers, build desktop systems and build laptops, etc. Knowing that tech-setters are setting a trend and really being considered more as unofficial experts in the field, they’ve always worked for us as the number-one audience to go after. As times change and we embraced social media, instead of going to computer clubs and reaching 20, 30 or 50 people at a time, we could reach thousands and thousands of people on Facebook. And by using other tools like Twitter and blogging, etc., we’re looking at reaching more of a mainstream audience. Mike: Let’s talk about your Facebook wall strategy. Can you share a little bit about what kinds of content you post on your wall and how the brand has benefitted from what you’ve been doing? Ekaterina: Nowadays it’s all about news feed optimization. It’s almost becoming the equivalent of SEO for Facebook. For those folks who are not really familiar, news feeds display the most popular stories on Facebook. According to Facebook, 0.02% of stories actually make it to the news feed, which is rather scary if you look at it as a marketer. You want to be seen and heard. However, if your status updates are not getting into people’s news feeds, you might just as well not send them. There’s a unique amplification effect that Facebook has, where if your friends see it, their friends might also see it, especially if you comment or engage on the brand’s wall. Or if you “like” a brand, it’s also being seen by all of your friends. Basically, you want your fans to see it, but more importantly, you want them to engage with you. Because of the news feed algorithm and the engagement they call fan growth, the higher the engagement with you (which are likes, comments, etc. ), the more likely it is that your page will be picked up by the Facebook algorithm and make it into the news feed. They told us they want to stay on top of technical news. They want to be the first to know about Intel products that are coming out and what we were up to in general. They also liked the fact that they can chat with their fellow geeks and ask them for all kinds of advice about how build their own system. It is important to learn our fans’ likes and dislikes. Either it’s based on their reactions to particular posts or the polls that we run. We alter our content strategy accordingly. Another thing is we monitor engagement spikes and track “aha” moments. Sometimes you would be surprised at what type of content your fans respond most to. Intel shows a fun side with holiday wishes. The other thing is we try to be human by sending best wishes to our fans during holidays or asking them what their favorite holiday tradition is, which is quite often no different from how you would talk to your friends. That garners a lot of engagement and positive comments. Something like saying a simple “thank you” when they pay you a compliment or tell you how much they love your product is also extremely important. It’s anything that encourages and continues the dialogue. Our organic monthly growth more than tripled ever since we really looked at our Facebook engagement strategy seriously, so we’re definitely reaping the benefits and helping continue that two-way dialogue. Mike: If you had to give one or two of your best engagement tips, what would they be? Ekaterina: It’s all about trial and error and learning what works for your audience. An important thing to remember is that what works for some might not necessarily be the right thing for you, so you really need to try to play with it. It did not work. To make it work, you need a good editorial calendar and editorial strategy. At times, we would have several updates a day and some days we didn’t have any updates. It was difficult to coordinate this many bloggers. In some instances, we would have updates that would be hidden just because there were six in a row. The other bad thing about automated content is the fact that the news feed doesn’t really pick it up. So it’s not making it to people’s news feeds. That is very important to remember. First of all, when the update is customized, people comment on it much more. The other thing is you can ask questions. You can post an announcement, post videos and ask people, “What do you think?” It really motivates them to be engaged and to answer. If you don’t ask, they would probably comment, but the engagement is not going to be as big. 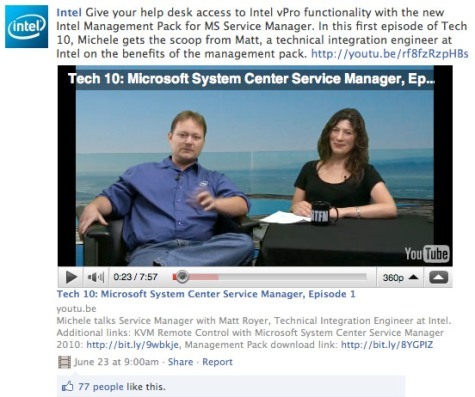 Videos are a regular part of Intel's Facebook wall strategy. There is another one of my favorites that I notice not a lot of people know about. Video is your secret weapon. I know everybody says that; however, not only do news feed algorithms prefer media like video and photos and favor them, there is another feature that has just been announced the end of last year, and for some reason it was just really quiet and not a lot of people picked it up. If you upload a raw video file, not just linked from YouTube but uploaded on Facebook, and your fans share it with their friends, when somebody who’s not a fan or liker of your Facebook page actually watches the video, there is a sweet little thing—a button that pops up on the upper-left corner of the video that invites you to basically like the page, or in the old terms, to become a fan of the page. That is the fastest way for folks to just click on it and become a fan. It’s a really outstanding call to action, and so I do encourage folks to upload raw files versus just linking to YouTube, which is the easiest thing to do. However, it’s not as effective for your engagement strategy. 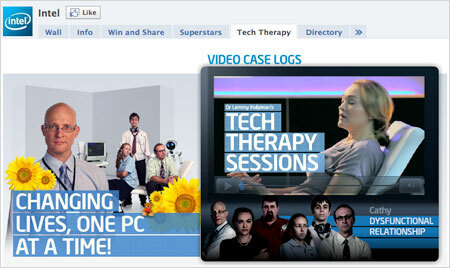 Mike: You have a cool little tab called “Tech Therapy” currently on your Facebook page starring Dr. Lemmy Halpman. These are really cool little videos, funny little videos actually, of people in technology therapy sessions. Share a little on the strategy behind these videos. Ekaterina: This program was originally created in Australia. We decided to feature them on our main Facebook page. Dr. Lemmy Halpman discusses dysfunctional relationships between patients and their PCs in funny videos. Lemmy Halpman came about by the Australian team. It has been popular. The concept is to talk to people about what makes their computing great and what blockages are in the way of their attaining that true computing happiness. It shows the benefits of how many things you can do differently. Faster processing power and less wait, etc., are among them. Mike: You’re a big brand, so why come up with videos like that? What’s the underlying strategy? Mike: Talk to me about contests. Do you run them only on Facebook? Do you have Twitter components? How have your contests and promotions helped your brand? 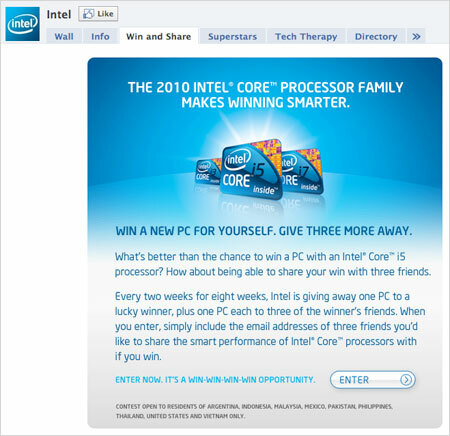 Intel runs regular contests on its Facebook page. Ekaterina: We do promote through Twitter, but we try not to really think short-term. We try to integrate in our current properties. Every time we drive folks to a property, we want them to stay, and we want that property to exist long-term so we continue building investment into that. Of course we do struggle with the fragmentation, but we’re working on solving it. Contests are great at increasing buzz. Every time we run one, the traffic to the page and our viewership probably increases 500%. Mike: How do you drive people to learn about your contests on Facebook? Ekaterina: The wall is effective because we do have a highly engaged audience, and Twitter has been effective. Mike: Let’s talk about inside Intel. How are you organized when it comes to social media? Is it all managed through your Center of Excellence or do you have different units doing their own thing? Ekaterina: We started with a lot of grassroots. We’ve been doing social media for years. We started with blogs way back in 2004. We started to learn from the grassroots and tried to understand the social media space better. A few years ago our corporate marketing VP said it was time we got organized and educated on social media. We shifted some of our budget into digital. After the social media guidelines, we created the Digital IQ training program that educated over 5,000 of our marketing employees on social media. We created a university-like program that’s been going on for the past couple of years. Then we decided we really need a function that would help enable the rest of the company. That’s how our central team, the Social Media Center of Excellence, came to exist. Mike: What would be the one single piece of advice you would give one of your peers who’s at a corporation that’s just now getting underway with social media marketing? Ekaterina: You want to tell them so much, that one is hard. If I’d say one thing, it’s don’t let the opportunity to engage with your customers slip by just because you’re afraid of potential negative reactions or comments. I actually talked to Doug Frisbie, a Toyota national marketing manager, when he took over right before their crisis. He said, “The price of inactivity is greater than the risks of anything we’d be doing in social media,” and it is absolutely true. Mike: That’s a really solid piece of advice. If people want to learn more about what Intel is doing with social media, where should they go? Ekaterina: There’s Facebook.com/intel, Twitter.com/intel, YourTube.com/intel, then, of course, Intel.com. Our blog is at Blogs.intel.com. Mike: I want to thank you so much for taking some time out today and sharing a lot of your great insight with us. You were spectacular. Ekaterina: Thank you so much for having me, Mike. It was great fun. Listen to the full interview below to learn how Intel manages its Twitter accounts, monitors social media and mobile marketing. 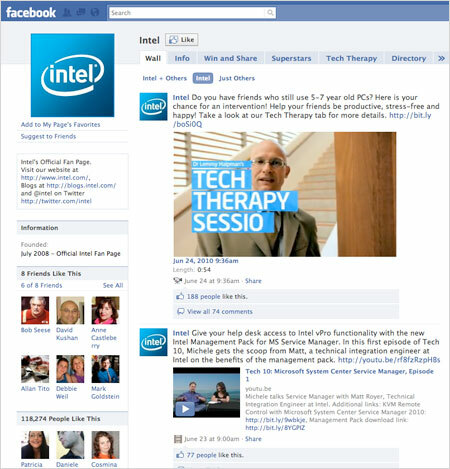 What do you think about Intel’s Facebook page and general social media activities? Leave your comment below.